Virgo stretches across the evening sky this spring: Here it is at 9 p.m. EDT on May 11, 2018 over New York City. Just in time for Mother's Day, look up to see Virgo — the only feminine figure among the zodiac constellations, who in a way represents Mother Earth. 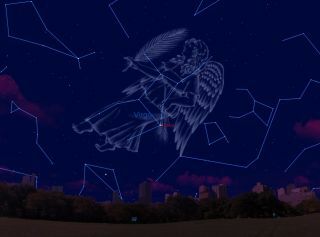 Virgo, the Maiden, currently covers much of the southern sky during the late-evening hours. Examining the star pattern's scattering of mostly faint stars, ancient skywatchers envisioned the Greek Earth goddess Demeter, and Ishtar, the Babylonian goddess of fertility. But perhaps Virgo's connection to Mother Earth is most appropriate at this particular time of year. For Demeter was a symbol of Earth and of the life that lies buried in the earth, the winter death and anticipated spring revival of green, growing things. And now, as we have just passed the midpoint of spring, we find Virgo encompassing much of the southern sky. Indeed, Virgo is a big constellation. In fact, she is the second-largest among the 88 that are represented in our sky. The largest, coincidentally, lies just below Virgo and seems to slither from east to west across the sky: Hydra, the Water Snake. But Hydra's position at the top of the size list stems primarily from its extraordinary length. Virgo, on the other hand, is large because it covers a large swath of sky: 1,294 square degrees, to be precise. That's quite a bit of celestial real estate! Unfortunately, as we already mentioned, most of the stars of Virgo are rather dim. In the sky, we are supposed to visualize a young lady with a shawl over her shoulders, although many star guides trace out a pattern that resembles a large letter "Y" in the sky. And the lone exception to all of Virgo's stars being generally faint is bluish Spica, which marks the spike of wheat that Virgo is holding in her left hand. Locating Spica is relatively easy. Just look high in the northern sky at a point almost directly overhead around 10 p.m. your local time for the stars of the Big Dipper. Now draw an imaginary line through the Dipper's handle outward — in a sense, you're making an arc — and keep going until you reach a very bright, yellow-orange star. That's Arcturus in the constellation Boötes, the Herdsman. Continue on a course beyond Arcturus and the next bright star you come to will be Spica. Or in the words of a popular mnemonic, "Follow the arc to Arcturus, then speed to Spica." Spica is the 16th brightest star in the sky, and best estimates place it at a distance of 250 light-years (give or take 10 light-years) from Earth. When you look at the speck of light in the sky that is Spica, you are actually looking at two stars that rotate around their common center of gravity once every four days. They are so close together — 11 million miles (18 million kilometers) from each other — which is less than one-third the average distance of the planet Mercury to our sun — that we cannot see them as two separate points of light, through even large telescopes. Rather, astronomers discovered Spica's dual nature in 1890 by way of spectroscopic observations. The larger (primary) star provides approximately 80 percent of the light we see from Spica and is estimated to be roughly seven times wider, 10 times more massive and 2,300 times more luminous than our sun. Because the two stars revolve so quickly around each other, it is believed that the shape of both stars is somewhat distorted, more like the shape of an egg. Spica may also be regarded as the standard example of a star of the first magnitude, since it has a measured mean visual magnitude of 1.0 (although, since Spica is slightly variable, that number can fluctuate by several hundredths of a magnitude). As we noted, Virgo is holding a spike of wheat where Spica glows, possibly representing the harvest time, which occurred at the same time that the sun was passing this star. In our time, the sun passes closest to Spica on Oct. 16 — rather late in the season for harvesting crops. But about 17 centuries ago, Spica was very close to the place in the sky where the sun crosses the celestial equator on Sept. 2, marking the autumnal equinox. Spica is also due south this week at around 11 p.m. local daylight time and, in 2018, forms one corner of a large, bright triangle with Arcturus and the brilliant planet Jupiter. Last, we should mention that within the boundaries of Virgo is an amazing region of the sky known as the "Realm of the Galaxies." Here lies a celestial wonderland of star cities; an amazing concentration of dimly luminous patches. Several thousand galaxies have been photographed here with great observatory instruments as well as with the Hubble Space Telescope. Every one of these dim blobs is a star city, and astronomers have said the average mass of each galaxy is some two hundred billion times the mass of our sun. The best estimates indicate that the galaxies are located somewhere between 40 million and 70 million light-years from us; in other words, in some cases, the light that we see arriving at Earth right now started on its journey at a time when dinosaurs freely roamed our planet.